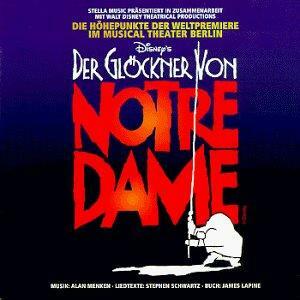 The Hunchback of Notre Dame has a long film history of being a big grand production and Der Glöckner von Notre Dame of does a good job of capturing a grand scope on stage. 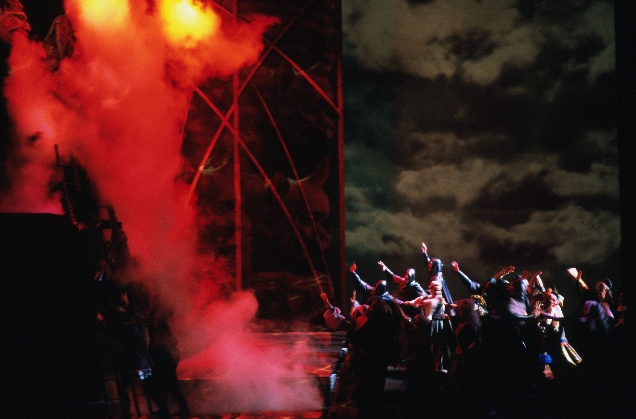 The Stage Design uses a lot of tricks to simulate heights and locations. They way the show does this is by using hydraulic to raise portions of the stages and they also use projections to show various locations. 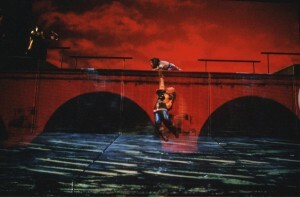 The Lighting also work well to capture the mood of the scene by also lets the projections shine. For example, a Rose Window Projection with columns on stage and soft dark lighting to indicate the nave of Notre Dame or Clouds and Stone Carving with bright lights to show the top of the tower of Notre Dame. 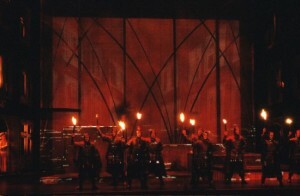 There are also a lot of moving pieces which add to the spectacle. The overall effect looks well integrated and rich and less cheesy than standard sets. 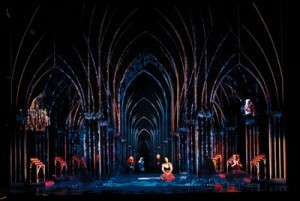 You can tell that this where the budget was mostly spent but I think it was worth it The Stage design combine the sets, lighting and projection to give Der Glöckner von Notre Dame a grand majestic style. Grand Finale or Ultimo Finale is the ending and occurs in two parts. 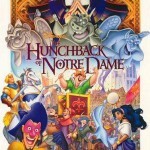 The Finale is where the two most famous differences occurs; The death of Frollo by Quasimodo and the death of Esmeralda. Apparently the translator Michael Kunze campaigned to have Esmeralda die which makes it more like the book, though her death is by a different method. 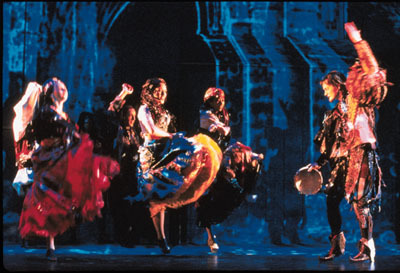 Kunze’s reasoning for this is that Esmeralda’s death would be viewed by European audiences as moving and more romantic of an ending. We’ll see how the American Broadway version handles this, though I kind of hope they keep the German ending. 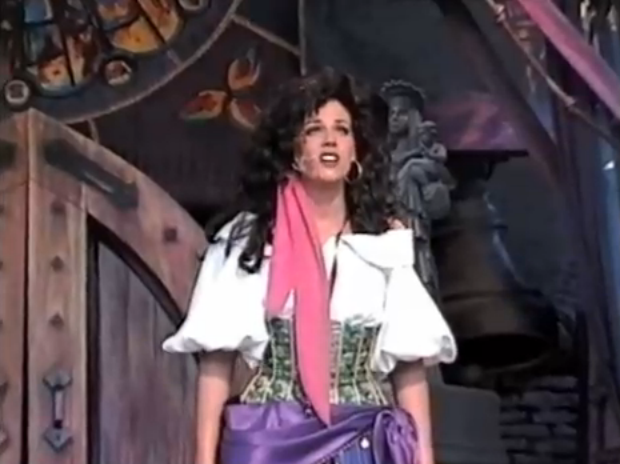 The Final starts with Frollo pronouncing Esmeralda’s sentence then it goes into “song” portion. I use the word song in quotes because the Finale is a melody piece as it uses songs from throughout the show with one exception. So it starts pretty much the same as the movie with Sanctuary playing complete with latin lyrics as Esmerlada starts being burned and Quasimodo saves her and proclaiming sanctuary. 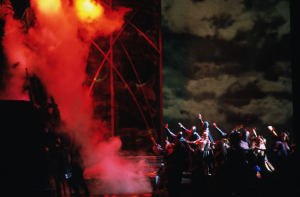 Then Phoebus starts railing the people of Paris with the tune of Einmal (Once). 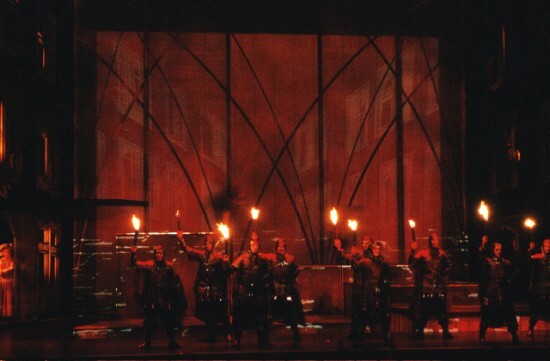 Then the scene shifts back to Quasimodo who is defending Notre Dame from Frollo and his minions as he sings the tune of Wie aus Stein (Made of Stone). 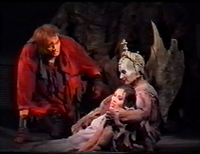 After he pours the led from Notre Dame Quasimodo checks in on Esmeralda who is dying. My guess is she dying of asphyxia which is a condition of severely deficient supply of oxygen in body that arises from being unable to breathe normally. In her case this occurred from the fire. Anyway Quasimodo and Esmeralda have little conversation while Draußen (Outside) is played in the background. 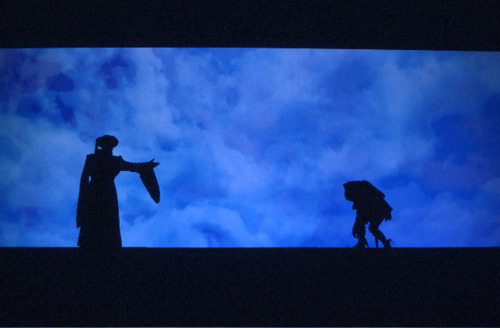 Esmeralda thanks Quasimodo for being her friend and then sings Hoch über der Welt (High above the World) and then the conversation continues for a couple more lines and then she dies. After she dies Frollo comes in and sings about how he happy to be free of her to the tune of Esmeralda but he sings this in a creepy, off balanced way. 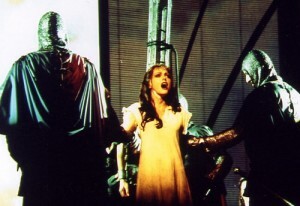 Quasimodo gets mad and the song shifts to a new melody with gargoyle singing with the latin choir. 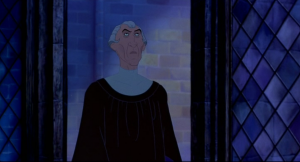 The gargoyle basically sing that God strikes the wicked, so the gargoyles, or aspects of Quasimodo’s own mind are telling him that he should kill Frollo, which he does by throwing Frollo off of Notre Dame, like in the book. I will point out that Quasimodo in the book does this in a fit of rage and here it’s a little more pre-mediated. After this the gargoyles sing Zuflucht (Refuge) about how the world is both cruel and kind. Quasimodo then sings Draußen (Outside) and sings about how he must live out there with all the pain, sorrow and fear that world can bring. He the carries Esmeralda outside and is joined by Phoebus. 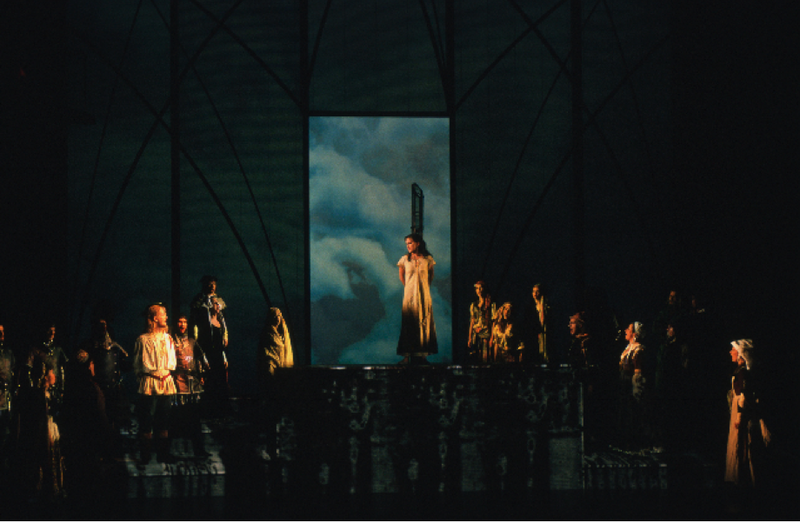 The ensemble then sing Einmal with as Quasimodo disappears. 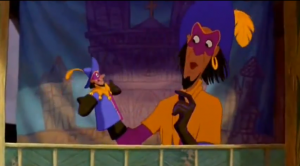 Then Clopin in his narrator role sings Die Glocken Notre Dames (The Bells of Notre Dame) and it’s pretty akin to the reprise at the end of the movie. It’s vague what happens to Quasimodo but given how he sings about living it is doubtful that Quasimodo goes off to die. Also considering the two deaths this pretty much same except for Quasimodo and Esmeralda epic running away scene, that’s not there either. So both Musically and plot wise we have a lot going on. However it’s a fitting ending. All the songs used here fit well together so while it could have felt a bit all over the place the emotional intensity flows well from one into the next. So if you like all these song before you’ll like them here. Wie aus Stein is Quasimodo’s despair song. 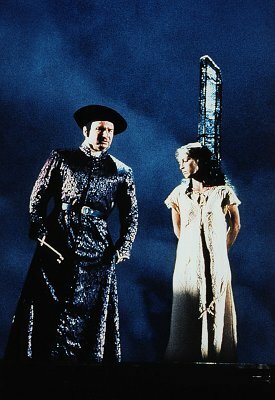 The song is lifted from the movie when the gargoyles are trying to convince Quaismodo to save Esmeralda who is moments away from death. In the musical this scene occurs the night before Esmeralda is to be sentenced and instead of a short scene between the gargoyles and Quasimodo, we have a song. This song is Quasimodo at his most angry and his most broken-hearted. He is clearly angry at the gargoyles as they don’t understand his pain as they’re made of stone and he wishes he was like them. He regrets his emotions and wishes they would go away. I really can’t not imagine the Disney movie Quasimodo getting this angry and morose. Plus it’s nice to hear Quasimodo really telling off the gargoyles. The title Wie aus Stein (Made of Stone) is taken from the original book when Quasimodo mournfully asks why he wasn’t made of stone. 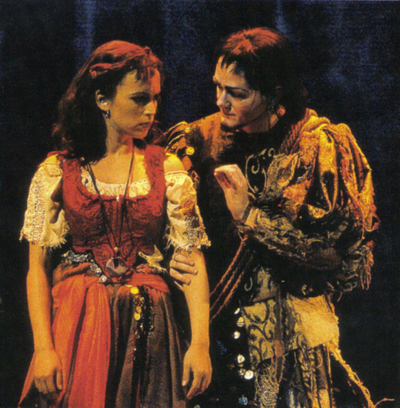 He’s not exactly angry in the book but more sad that he is in love with Esmeralda and can’t really do anything about it. Musically this song is great it has wonderful tension and drama. 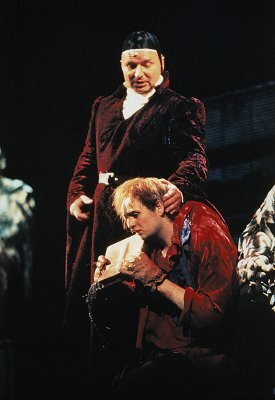 Quasimodo voice moves though these soft parts like suppressing rage and parts him fully expressing his rage with great power in his voice. Quasimodo’s angry and despair really come though. I really enjoy this song, it’s a great way to showcase the singer for Quasimodo. I find this song oddly additive and it’s one of my favorites from the show. 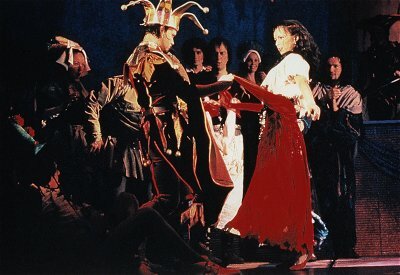 Einmal (Once) is the song Someday which was created as a second option for the song used in the “Esmeralda Prayer” sequence in the movie. However Someday was used as the credit song which had two pop song recording. Einmal occurs after Frollo gives Esmeralda his ultimatum in jail (Be Mine or Die). 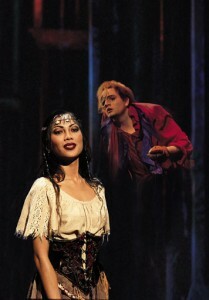 Esmeralda considers taking it if only to save Phoebus. 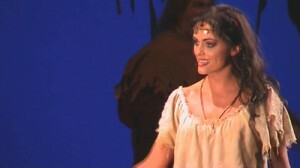 Phoebus tells her she should do it for herself, so she can live. 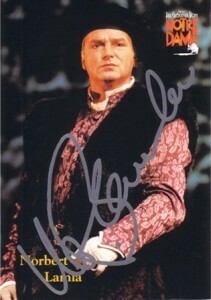 Esmeralda says she doesn’t consider a life with Frollo living. She then sings along with Phoebus and eventually with Clopin and the ensemble about how she hopes the world will learn after countless war and bloodshed to live and not to hate. Unlike Someday, Einmal’s lyrics are less soft and gentle. In Someday. Esmeralda sings about the world becoming more mature and in Einmal she sings about the world learning after making mistakes. 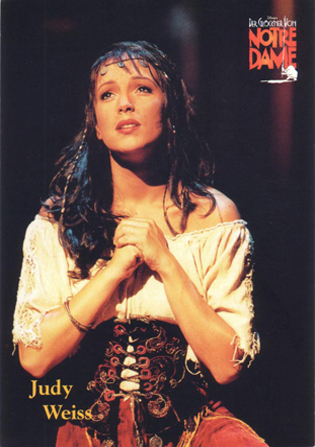 The song ends as Esmeralda about to be put to death which makes this song all the more poignant and dramatic as Esmeralda dying wish for the world. Muscially it’s a pretty song and while I like the inclusion of Phoebus, Clopin and the crowd, this means Esmeralda does not get a solo song of her own, which I find a bit sad. But as the song stands on it’s own merits, it is quite lovely and powerful with the overlays of singing. And like Wie aus Stein it’s high on my list of favorites from the show. Wie aus and Einmal are very nice counterpoints to each other in both mood and meaning. In Wie aus Stein we have Quasimodo who is depairing in life and in Einmal we have Esmeralda who has hope as she about to die. It a just a nice example of selfness vs altruism in the show, and I love contrast. 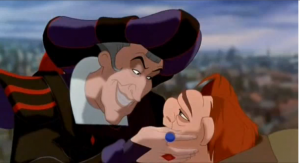 Weil du liebst (Because/Out of Love) occurs after Frollo makes his threat against Esmeralda and the Court of Miracle while Phoebus is trying to convince Quasimodo to leave Notre Dame and help warn her. Unlike the Disney movie, Phoebus is softer and more understanding with Quasimodo’s hesitation. 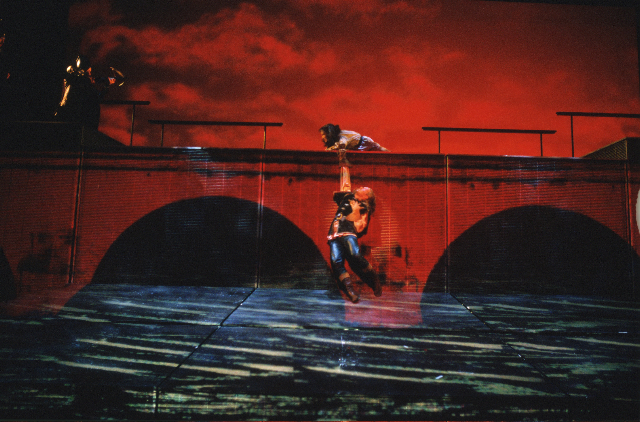 Phoebus understands why Quasimodo does not want to leave and he tells him it because of the love that he must do it. 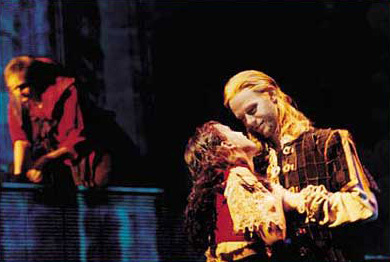 It also interesting to mention that Phoebus has not solidify a romance with Esmeralda yet. 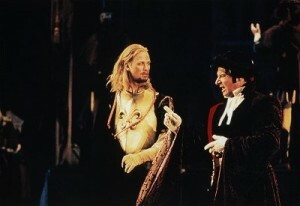 Unlike the Disney movie, it’s the Archdeacon who asks Quasimodo to hide Phoebus. So Phoebus is being a bit more altruistic here. Also I want to point out that Phoebus was a jerk in this scene in the Disney movie. 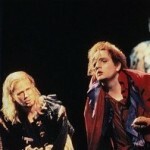 He told Quasimodo that he owns Esmeralda for helping him. 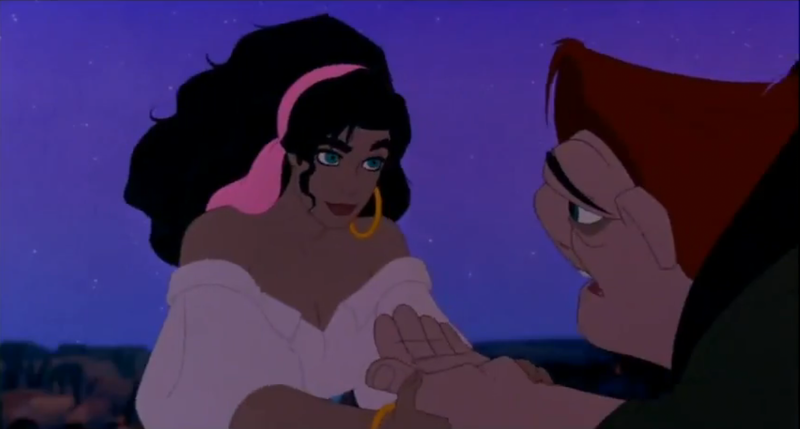 However Esmeralda helped Quaismodo from the crowd partly because she pulled on stage and she had a sense of guilt about it and Quasimodo already repay her when he helped her escape Notre Dame, so he actually owns her nothing, bad argument Phoebus. This scene/song is a VAST improvement to the Disney counterpart. Musically this song uses a bit from Ein bißchen Freude at the beginning but it turns gentle and sweet. 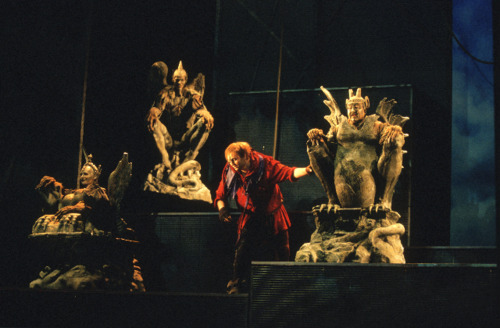 The gargoyles get in on that song and help convince Quasimodo to help. It’s a nice song but I feel that it exists more for the reprise than the set-up. 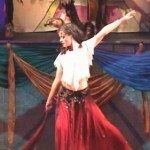 Tanz der Zigeuner (Dance of the Gypsies) replaces the song “Court of Miracles” from the movie. On it’s own it’s a fun little instrumental dance number that provides levity before the show gets dark. Musically it sounds like Gypsy music with the melody from Tanz auf dem Seil. I just wish this could have existed along side Court of Miracles since it was one my favorites from the movie. Oh well, can’t have everything I suppose. Still it a nice addition to the show and I enjoy it. 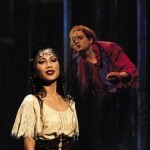 Weil du liebst Reprise a.k.a Esmeralda & Phoebus are in love and Quasimodo gets the shaft. So after Phoebus and Quasimodo warn the Gypsies, Phoebus and Esmeralda decide to leave Paris together. 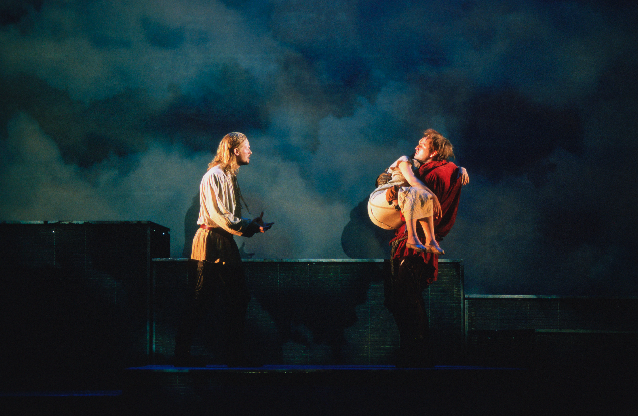 While Esmeralda and Phoebus declare their love Quaismodo watches them heartbroken. The song gives Phoebus and Esmeralda a love song which was sorely missed from the movie but in this song the love story has a complexity. Neither of them ever envisioned being in love. The song also works to contrast against Quasimodo’s heartbreak better than in the movie. In the movie Phoebus and Esmeralda kiss and Quasimodo thinks of Heaven’s Light and he rips up an Ace of Hearts playing card. 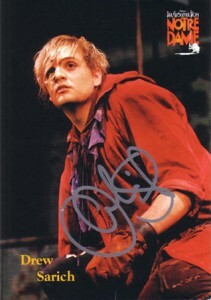 In this song Quasimodo pain is more felt though his singing. 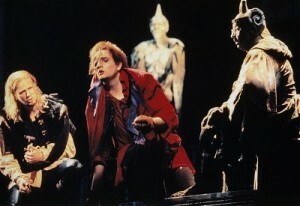 But then against Quasimodo in the show is a bit more angry and less “boyish”. 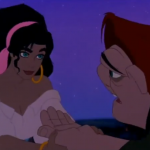 However the presentation of Phoebus and Esmeralda singing lovingly against Quasimodo’s pain could have worked in the movie as the focus doesn’t leave Quaismodo which was very important from the Disney movie directors (eye-roll) and it doesn’t kill the pace as they sing this before fleeing which makes more sense than a wedding. Musically the song uses Weil du liebst, Das Licht des Himmels and a touch of Draußen at the end. I really enjoy this song it provided enough levity and yet angst before the ball drops completely on the angst. Trommeln in der Stadt (Drums in the City) is a new song that uses Sanctuary from the original soundtrack. This song opens Act 2 and it expresses what the citizens think of Crazy Frollo’s search for Esmeralda. At first when they though it as just about “cleansing” (creepy word choice huh?) the city of Gypsies that was fine but with the all the soldiers, blockages and fire they’re are none to happy about it. Like I said this song uses the music from Santuary, which is the music playing when Quasimodo is recusing Esmeralda from the Pyre in the movie, so the music is great. 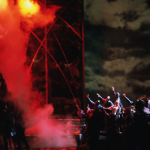 It’s dramatic and has high energy which is a great way to start the the second act. It also great to see how the normal people of Paris react to Frollo’s obsession. Ein Mann wie du (A Man like you) is A Guy like you. It pretty much the same as the original song but it’s less annoying. 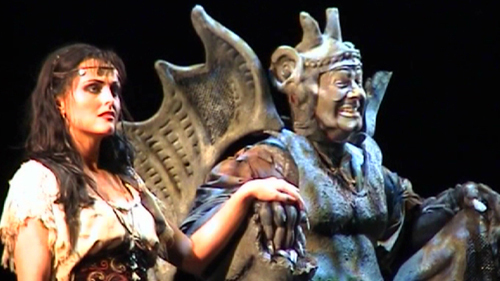 Instead of making visual gags the Gargoyles throw random French words and phases into the song. Which isn’t as annoying as it sounds. 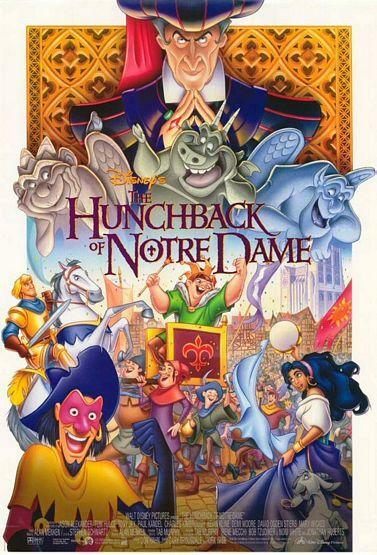 The song has one other difference Quasimodo sings in it. 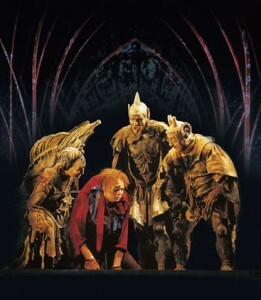 From what I can understand of the lyrics (because my German is non-existence) is that Quasimodo expresses that he wants to believe the Gargoyles but doesn’t quite. 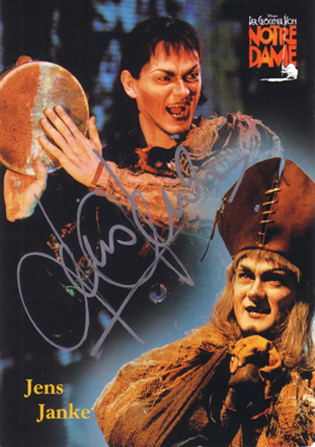 Musically I don’t think it adds much I guess it adds a bit of character development because this musically is a a lot guilty at throwing Quasimodo at the audience but at least he is more interesting here than the Disney movie Quaismodo. Given that this song in it’s conception is song that provides levity it’s a little awkwardly placed in this musical. As movies have continuous action something was need after Hellfire, the torture of Gypsies, the burning of the house, Phoebus getting shot and falling in the river to bright up the mood and while I don’t like A Guy like you at least the placement makes sense. Ein Mann wie du as a song of levity doesn’t really work. It’s the second song in Act 2 so the audience has had a break and the song prior didn’t have an emotional investment in it as it’s just about the Citizens of Paris. So ultimately and this pains me to say it’s not as successful as A Guy like you, it’s just better performed and not nearly as annoying. So it’s mixed I don’t hate this song as I hate it’s Disney counterpart but I dislike the song in the musical as it doesn’t work as it’s concept intended. It hard because I like 10x better than the Movie version.